For maps, traveler tips, and more tourist information, use the Malaga trip generator. London, UK to Malaga is an approximately 6-hour combination of train and flight. You can also take a train; or do a combination of car and ferry. The time zone difference when traveling from London to Malaga is 1 hour. In July, Malaga is somewhat warmer than London - with highs of 36°C and lows of 24°C. You'll set off for Estepona on the 25th (Tue). 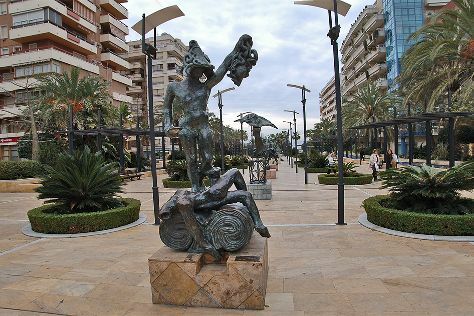 Estepona is a town and municipality in the comarca of the Costa del Sol, southern Spain. On the 25th (Tue), appreciate the extensive heritage of Avenida del Mar, then steep yourself in history at Plaza de toros de Estepona, and then stroll through Del Cristo Beach. For maps, more things to do, other places to visit, and tourist information, read Estepona vacation trip planner. Drive from Malaga to Estepona in an hour. Alternatively, you can take a bus. Traveling from Malaga in July, you will find days in Estepona are little chillier (32°C), and nights are about the same (24°C). Wrap up your sightseeing on the 25th (Tue) early enough to drive to Tarifa. Start off your visit on the 26th (Wed): enjoy the sand and surf at Los Lances Beach, kick back and relax at Playa Bolonia, and then pause for some serene contemplation at Iglesia de Nuestra Senora Del Carmen. Here are some ideas for day two: stroll through Playa El Palmar and then stroll through Playa de Zahara de los Atunes. To find reviews, more things to do, where to stay, and tourist information, read Tarifa online itinerary creator. You can drive from Estepona to Tarifa in an hour. Alternatively, you can take a bus. In July, daily temperatures in Tarifa can reach 32°C, while at night they dip to 24°C. On the 28th (Fri), you'll have the morning to explore before heading off to Nerja. Nerja is a municipality on the Costa del Sol in the province of Málaga in the autonomous community of Andalusia in southern Spain. Relax by the water at Playa de Burriana and Playa de la Cala el Canuelo. You'll explore the less-touristy side of things at Río Chíllar and Church of San Antonio. There's still lots to do: explore the fascinating underground world of Fundación Cueva de Nerja, indulge your taste buds at Moin Moin Nerja / Deutsche Backerei, don't miss a visit to Balcon de Europa, and explore the ancient world of El Puente del Águila. For other places to visit, more things to do, maps, and more tourist information, go to the Nerja trip itinerary maker. Getting from Tarifa to Nerja by car takes about 2.5 hours. Other options: take a bus. Traveling from Tarifa in July, expect nights in Nerja to be about the same, around 22°C, while days are somewhat warmer, around 41°C. 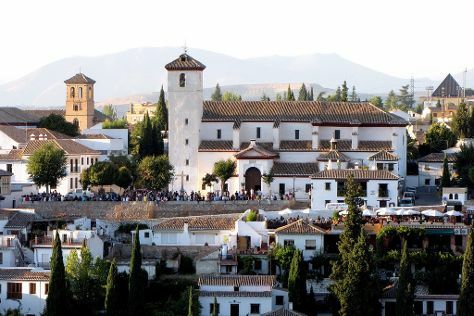 Finish your sightseeing early on the 31st (Mon) so you can drive to Granada. On the 31st (Mon), explore the stunning scenery at Los Cahorros, admire the landmark architecture of Generalife, and then take in the architecture and atmosphere at Basilica of San Juan de Dios. For where to stay, traveler tips, photos, and other tourist information, you can read our Granada vacation builder. You can drive from Nerja to Granada in an hour. Alternatively, you can take a bus. In July, daily temperatures in Granada can reach 41°C, while at night they dip to 22°C. Wrap up your sightseeing by early afternoon on the 1st (Tue) to allow time for travel to Alora. Álora ist eine Gemeinde und eine Stadt in Andalusien in Südspanien. On the 1st (Tue), contemplate in the serene atmosphere at Colegiata de Santa Maria la Mayor. For traveler tips and tourist information, read Alora custom trip planner. You can drive from Granada to Alora in 2 hours. In August, daytime highs in Alora are 36°C, while nighttime lows are 25°C. 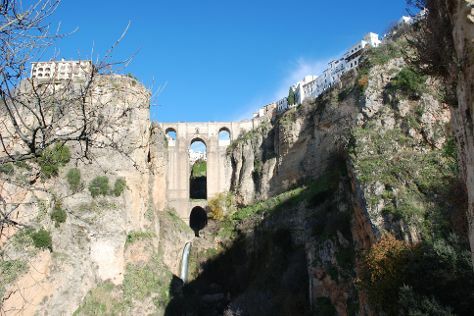 Finish up your sightseeing early on the 3rd (Thu) so you can travel to Ronda. Kick off your visit on the 3rd (Thu): pause for some serene contemplation at Iglesia de Nuestra Senora de la Merced, take in the dramatic natural features at El Tajo, then delve into the distant past at Baños Arabes, and finally admire the landmark architecture of La Casa Del Rey Moro. To find reviews, ratings, traveler tips, and other tourist information, refer to the Ronda trip builder. Traveling by car from Alora to Ronda takes 1.5 hours. Expect a bit warmer weather when traveling from Alora in August: highs in Ronda hover around 41°C, while lows dip to 23°C. Wrap up your sightseeing on the 3rd (Thu) to allow time to travel to Alora. Kick off your visit on the 4th (Fri): explore the stunning scenery at El Caminito Del Rey, El Chorro, then steep yourself in history at Town Hall, and then take in the architecture and atmosphere at Los Remedios Convent. On the next day, don't miss a visit to Arco de Los Gigantes, contemplate in the serene atmosphere at Convento San Agustín, then take in the spiritual surroundings of Iglesia de San Juan de Dios, Antequera, and finally identify plant and animal life at Lobo Park. To find other places to visit, where to stay, traveler tips, and tourist information, read our Alora trip itinerary planner. Traveling by car from Ronda to Alora takes 1.5 hours. When traveling from Ronda in August, plan for little chillier days in Alora, with highs around 36°C, while nights are about the same with lows around 25°C. Finish your sightseeing early on the 5th (Sat) to allow enough time to travel to Malaga. To find maps, traveler tips, where to stay, and more tourist information, refer to the Malaga trip planner. Drive from Alora to Malaga in an hour. On the 5th (Sat), you'll travel back home.